One of my fifth great grandmothers was Susannah Lamothe née Corrin (1741-1803). Susannah was the daughter of Henry Corrin (1713-1769) and Susanna Corrin née Quay (1713-1784). In 1763 she married Dominique Lamothe (1731-1807), a former French prisoner-of-war. Lamothe had been a surgeon on the St Lawrence, a privateer brig, which was captured by the English and brought to Douglas, the Isle of Man, on 31 October 1760. England and France were at war, in what was later known as the Seven Years’ War (1756-1763). After their capture the officers and men of the St Lawrence were held in Castle Rushen as prisoners of war. Two weeks after their capture the French officers of the privateer St Lawrence applied to the Governor of the Island for their liberty, and joined themselves in a bond to Messrs. Ross, Black, and Christian, of Douglas, merchants. They were freed from gaol on parole. the French Doctor was no sooner released from being a prisoner of war than he became captive to Suky Corrin (the daughter of his landlord, Hall Corrin). He went to France for his prize money, bought a cargo of Brandy to Dublin & this day returned to his spouse. Dominique Lamothe and Susanna had eleven children. They lived in Castletown, Isle of Man, where he practiced medicine for 47 years. Susanna died on 9 November 1803, aged 62. Dominique on died 8 January 1807 aged 74. They are buried at Castletown. Philip Lamothe Snell Chauncy 1816-1880 my 3rd great grandfather. Rose died shortly before her son’s second birthday. In his memoirs, Philip Chauncy wrote “Having always resided at a distance from the Isle of Man, I have never known much of my Mother’s relations.” He knew his grandfather had been a prisoner of war and had been in correspondence with his cousin John Corlet LaMothe who had compiled the history of Dominique and Susanna from the records in the Rolls office of the Isle of Man. Copy of letter from John Quayle to Basil Cochrane 30 September 1763 From Atholl Papers – AP X17-25 retrieved fromhttp://www.isle-of-man.com/manxnotebook/history/ap/ap_x1725.htm The Atholl Papers are a very large archive of over 7,500 manuscripts & books donated to the Manx Museum (Manx National Heritage) in 1956 that cover the period from 1735 through to 1765 when the Dukes of Atholl were Lords of Man. 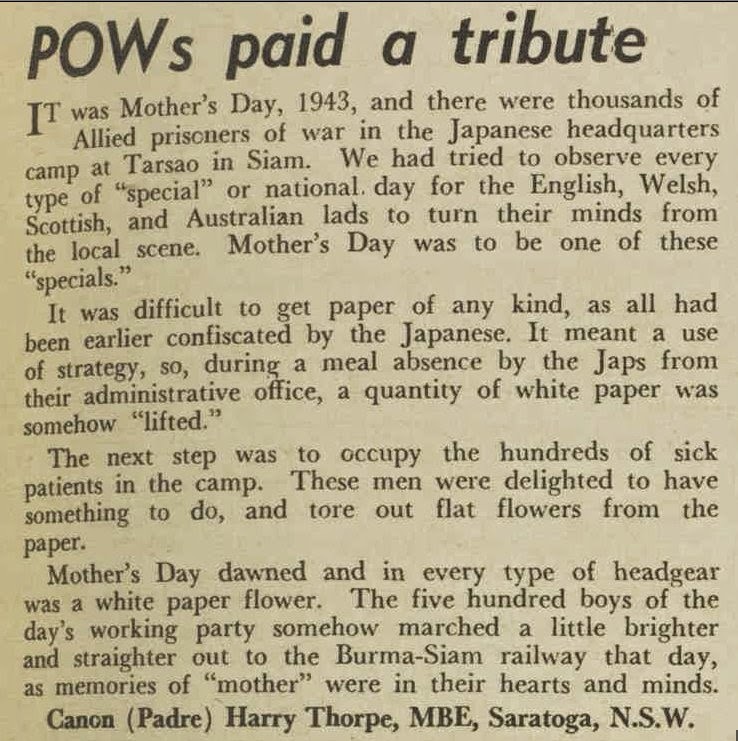 In 1967 the Australian Women’s Weekly held a Mother’s Day story-writing competition, for ‘The Best Mother’s Day I’ve Had’. The contest prompted many letters to the editor. 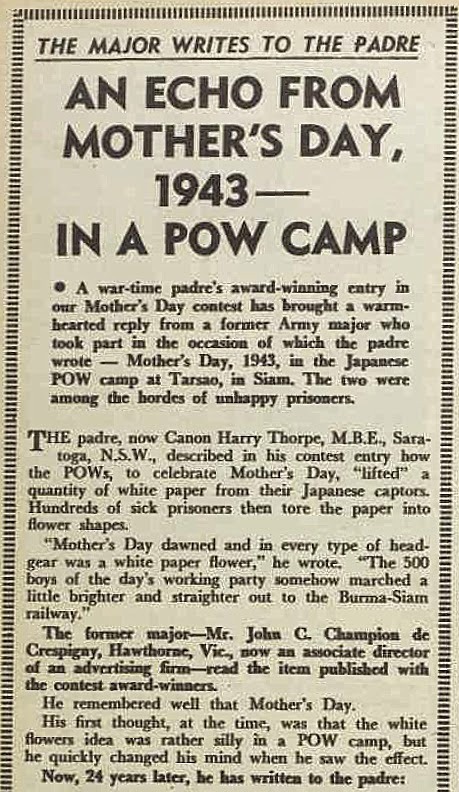 One, from Harry Thorpe, a former Army Padre, wrote about a Mother’s Day he had spent in a Japanese POW camp. 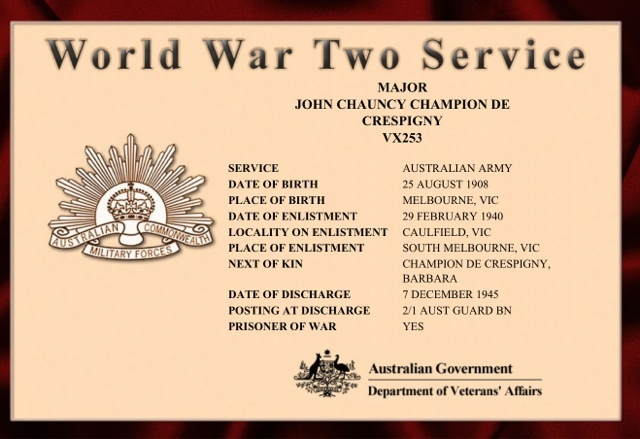 His letter caught the attention of my grandfather’s cousin John de Crespigny (1908-1995). de Crespigny, who in 1943 had been a Major interned in the same camp, wrote to Thorpe recalling the occasion. His letter was reproduced in the Women’s Weekly a month later. George Napier Sprod (1919 – 2003) was my second cousin twice removed on the Cudmore side of my family, one of my grandmother’s many second cousins. His grandmother Sara Cudmore was the sister of James Francis Cudmore, my grandmother Kathleen’s grandfather. 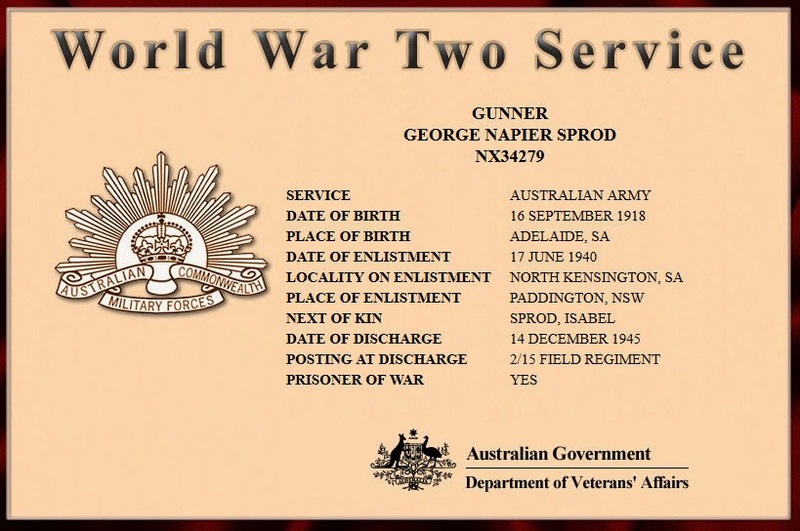 George Sprod enlisted in the Australian Army in 1940. He put his age up by one year. His mother was his next of kin. He served as a gunner with the 2/15 Field Regiment. members of the 2/15th found themselves members of parties bound for the camps along the Thailand-Burma Railway and in Borneo, Japan, French Indochina, Java, Sumatra, and Malaya. These men endured the worst horrors of Japanese captivity. 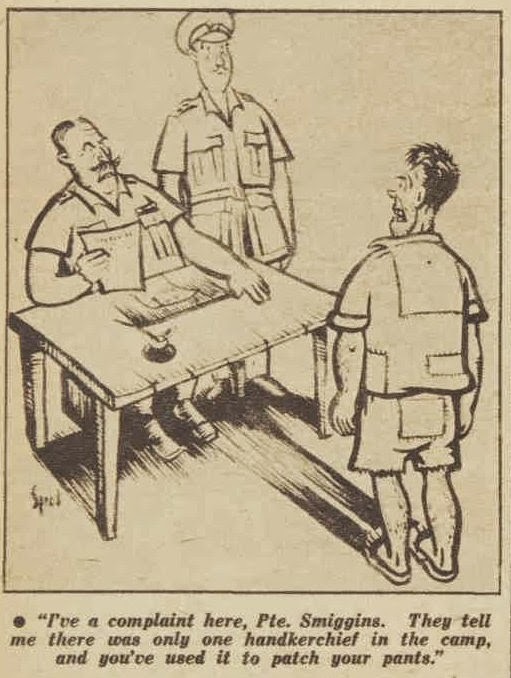 Of the 556 officers and men who became prisoners, 294 died. 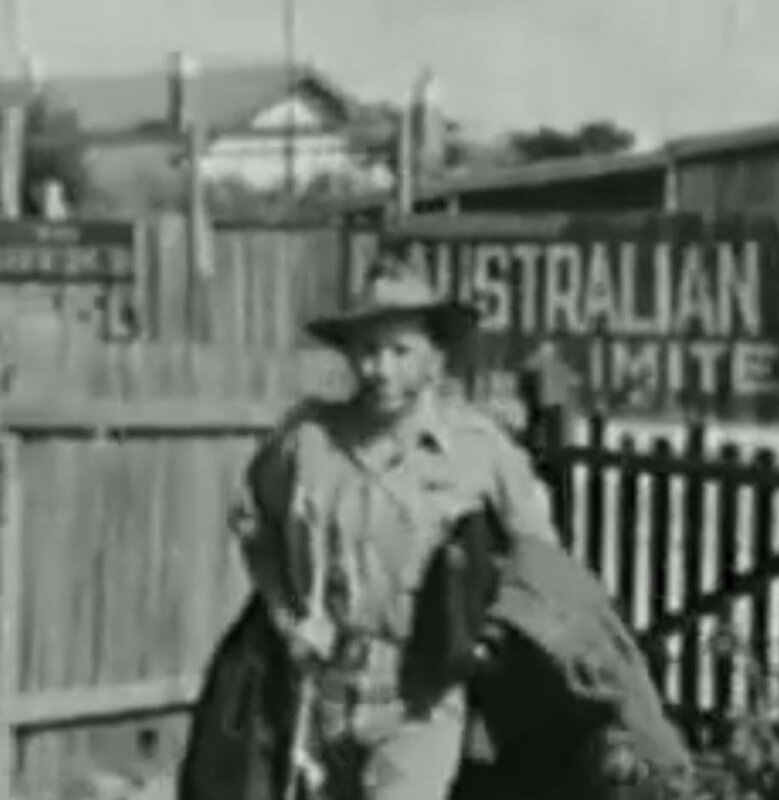 The surviving prisoners were liberated in late August 1945 and began returning to Australia almost immediately. He went to Sydney to try his luck as a cartoonist , riding his bicycle as far as Hay, New South Wales, a distance of about 400 miles (660 kilometers ). There he sold his bicycle and continued the rest of the way by train. He had various jobs before enlisting in the army. 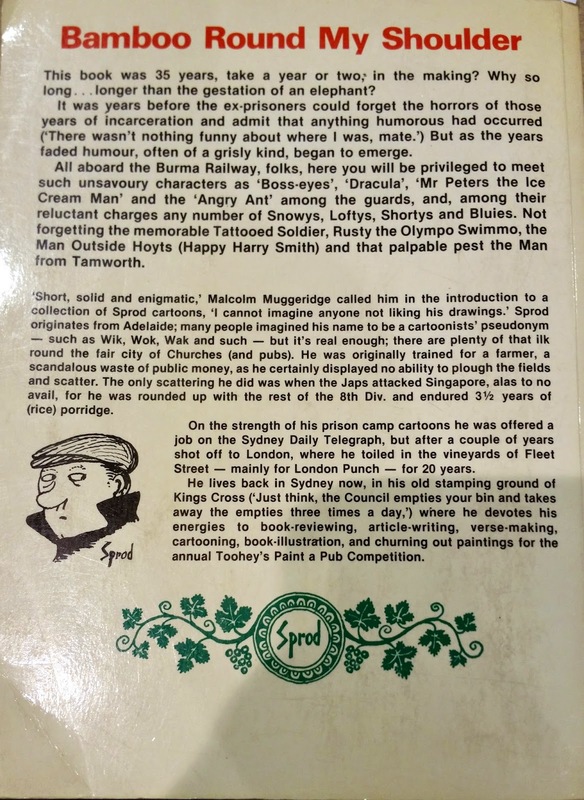 As a prisoner in Changi Singapore, Sprod met the English cartoonist Ronald Searle (1920-2011). 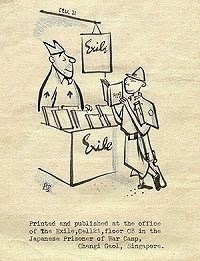 In September 1944 they founded and produced the fortnightly magazine “Exile“. There were ten issues. 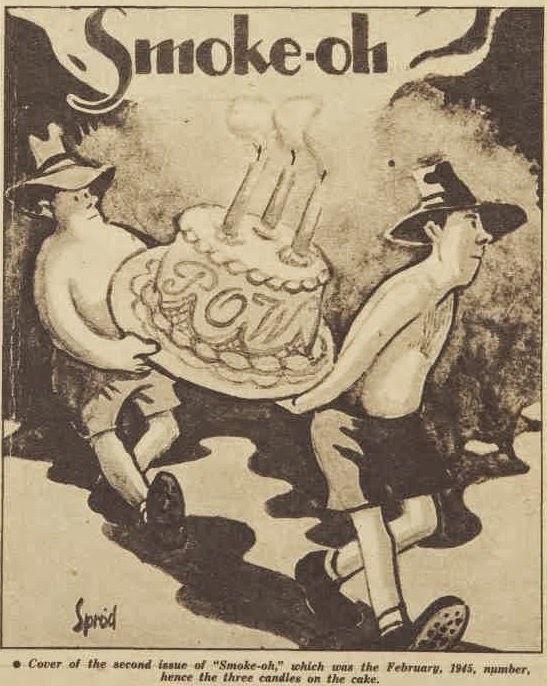 After a few numbers of the Exile Sprod decided that he would like to produce a journal with Australian appeal, which he called”Smoke-Oh” which ran for two issues only. 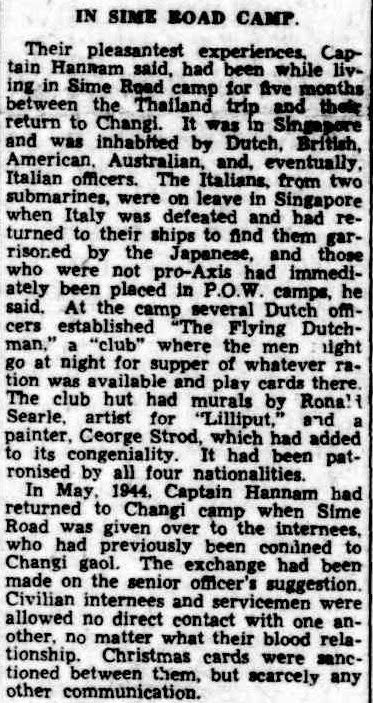 Sprod and Searle also painted murals in a club within the Sime Road camp. When he returned from the war George Sprod and his brothers made a short film called Christmas Crackers, re-enacting the family reunion when George and his brothers and brother-in-law returned from the war. The film is now held by the National Film and Sound Archive. 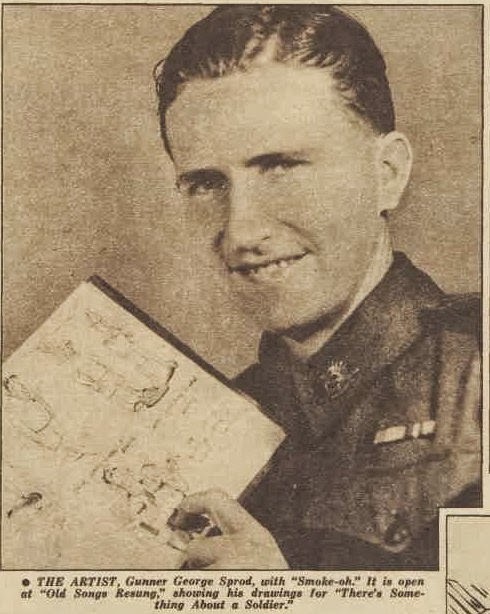 George also gave an interview to the Australian Women’s Weekly and wrote about his experiences for the Sydney Morning Herald, both articles illustrated with some of his cartoons. After the war George Sprod was a successful cartoonist, eventually working for Punch magazine. 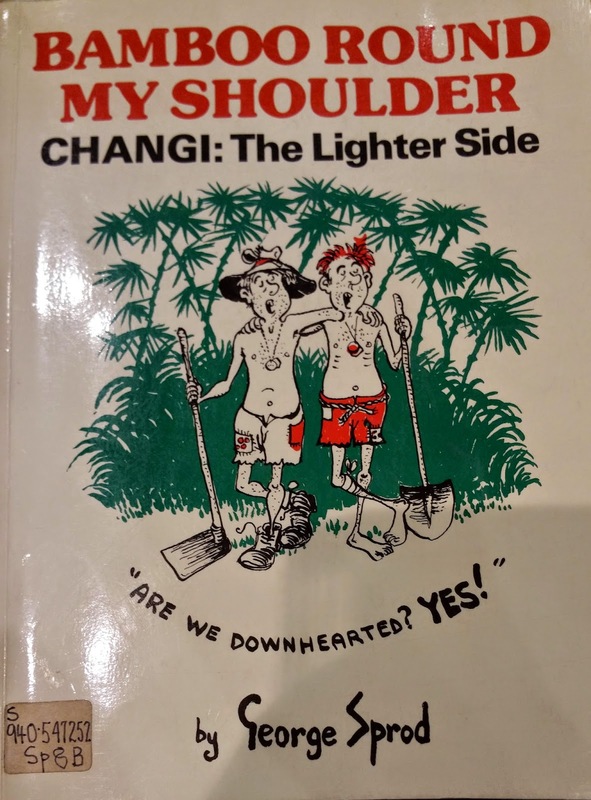 Nearly forty years after his experiences as a prisoner he wrote a memoir which again looked at the humorous side of life as a prisoner, though it did not overlook the misery and cruelty. George Sprod died in Sydney in 2003. Jones, Matt. “Changi Gaol 2.” Ronald Searle Tribute. Matt Jones, 26 Feb. 2008. <http://ronaldsearle.blogspot.com.au/2008/02/changi-gaol-2.html>. “A Funnier Side of Life, Even in War.” Sydney Morning Herald 10 May 2003. <http://www.smh.com.au/articles/2003/05/09/1052280441984.html>. Bryant, Mark. “George Sprod Writer and Illustrator Best Known for His ‘Punch’ Cartoons.” The Independent [United Kingdom] 16 Apr. 2003. <http://www.independent.co.uk/news/obituaries/george-sprod-36440.html>. Several of my relatives joined the Royal Air Force, or Royal Flying Corps as it was called during World War 1. I have written previously about Hugh Vivian Champion de Crespigny. Two other relatives, cousins of my paternal grandmother joined up: Frederick Cudmore Andrews and Ernest Osmund Cudmore. They both were captured and both became prisoners of war in the same camp, Holzminden in Lower Saxony. 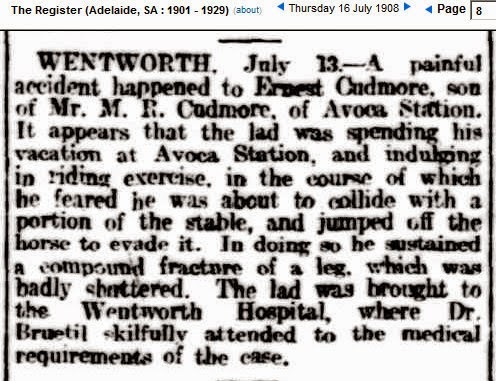 Ernest Osmond Cudmore was born 2 July 1894 at Glen Osmond, South Australia. He was the second of four sons of Milo Robert Cudmore (1852 – 1913) and Constance Cudmore née Alexander (1858 – 1913). Milo was the brother of James Francis Cudmore, my great great grandfather and Ernest was the cousin of my great grandfather Arthur Murray Cudmore. Ernest Cudmore in 1917 at the time he was issued with his flying licence (certificate) by the Royal Aero Club. Ancestry.com. Great Britain, Royal Aero Club Aviators’ Certificates, 1910-1950 [database on-line]. Provo, UT, USA: Ancestry.com Operations Inc, 2008. When Ernest was fourteen his leg was broken when he was thrown from a horse. The bone did not set and his leg had to be amputated below the knee. After the death of their parents in 1913, the four Cudmore boys were cared for by their aunt Lilian Alexander (1861 – 1931), a pioneering woman doctor. She became a noted surgeon in Victoria. Ernest took up racing motorbikes. In August 1916 he participated in a 24 hours’ reliability trial riding a 7 horsepower Indian in the sidecar class of over 600c. 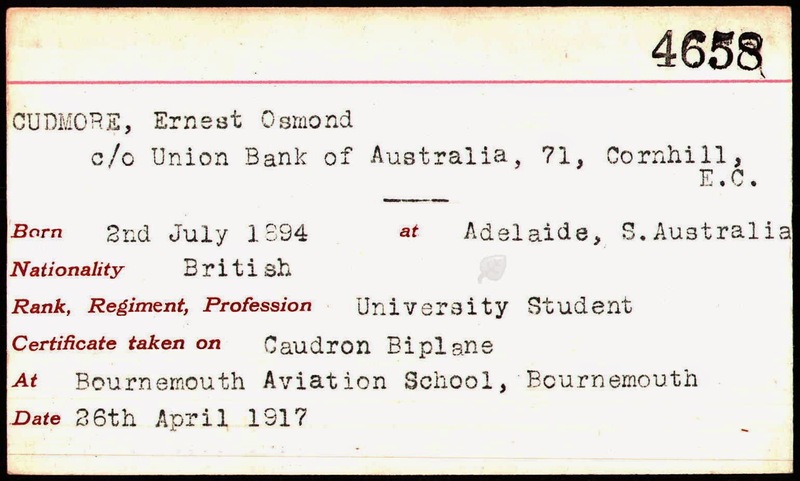 Ernest Cudmore sailed for England and acquired his aviation certificate at Bournemouth on 26 April 1917. Until 1911 the British military did not have any pilot training facilities. As a result most military pilots of the period were trained by members of the Royal Aero Club. By the end of World War 1, more than 6,300 military pilots had taken RAeC Aviator’s Certificates. On 6 June 1917 Ernest Cudmore enlisted in the Royal Air Force. On 23 August 1917 he was discharged as a 3rd class air mechanic as he had received a temporary commission on probation as a 2nd lieutenant in the General List for duty with the Royal Flying Corps. He was described at this time as 6 foot tall, keen and efficient with good military character. No descriptive marks were noted; the wooden leg was not mentioned. 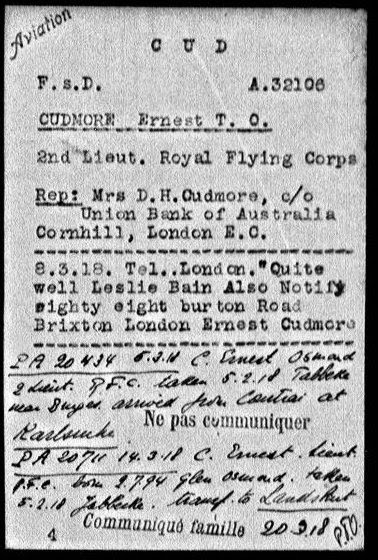 His next of kin to be informed of casualties as recorded on the service records was Mrs D. H. Cudmore, Union Bank of Australia, Cornhill, London. This is probably Mrs Martha Cudmore, the widow of Ernest’s uncle Daniel Henry Cashel Cudmore (1844 – 1913). She had sons fighting in the war, including Collier Robert Cudmore and Milo Massey Cudmore, cousins of Ernest. Ernest was confirmed in his rank of 2nd Lieutenant with effect from 13 November 1917. 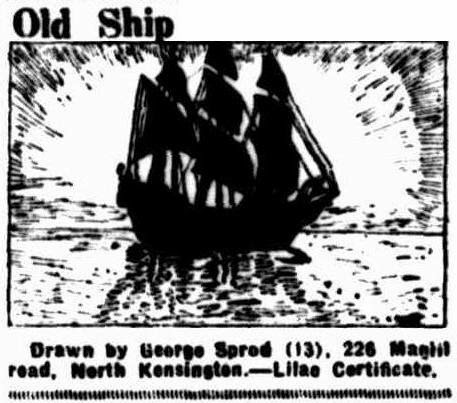 (London Gazette 15 December 1917). 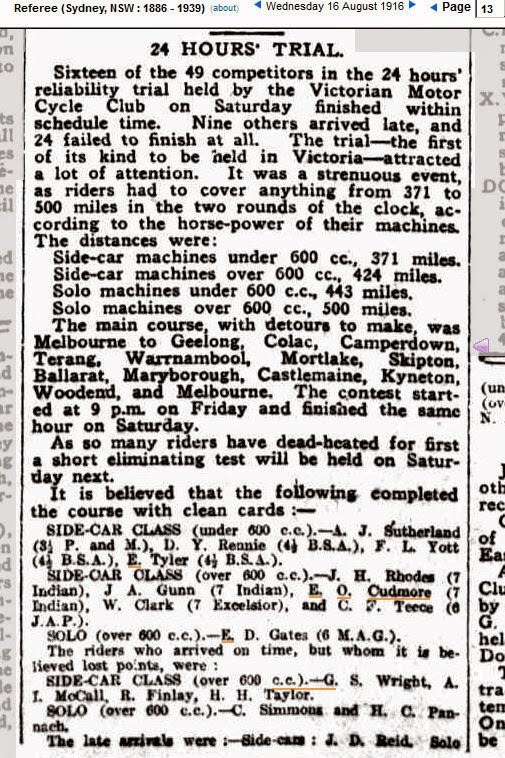 He was mentioned in dispatches gazetted 30 May 1919. 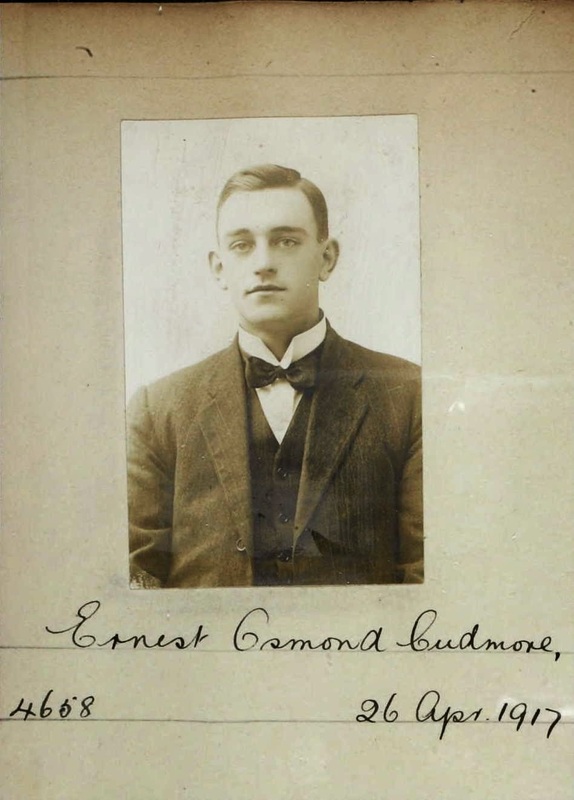 On 5 February 1918 Ernest Cudmore went missing and was taken prisoner of war. 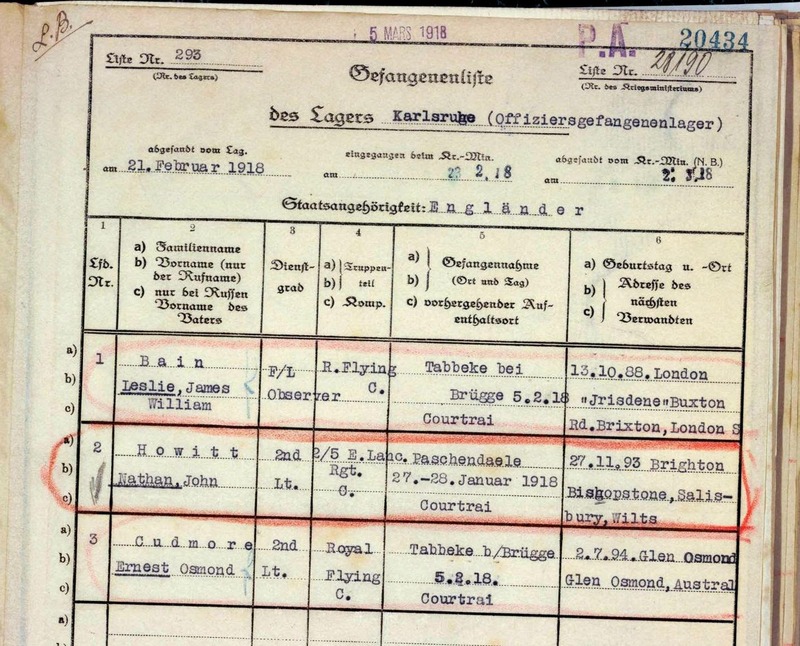 He was transferred to Holzminden. Ernest had been captured at Jabbeke, about 17 kilometres west of Bruges in Belgium. Sergeant Leslie Bains was captured at the same time. They were probably in the same plane. A family story has that Ernest tried to escape while a prisoner so the Germans took away his wooden leg. The story of Ernest’s life is continued at ‘B is for Buick‘. Philip, the brother of the first baronet, had died in 1803, so who was the Philip who was imprisoned? My family tree currently has ten Philip Champion de Crespignys though many of these are quite obviously not the man referred to in this book. My fourth great grand uncle Philip (1765 – 1851), son of Philip the brother of the first baronet seems to be the right man. Philip married Emilia Wade on 21 October 1809. She died in 1832. In 1851 Philip was recorded on the census as living at Harefield House in Middlesex with his half brother, my fourth great grandfather, Charles Fox. Charles Fox Champion de Crespigny was twenty years younger than his brother. Philip was described as a lunatic, by which I assume he was suffering from old age dementia. Source Citation: Class: HO107; Piece: 1697; Folio: 376; Page: 35; GSU roll: 193605. Source Information: Ancestry.com. 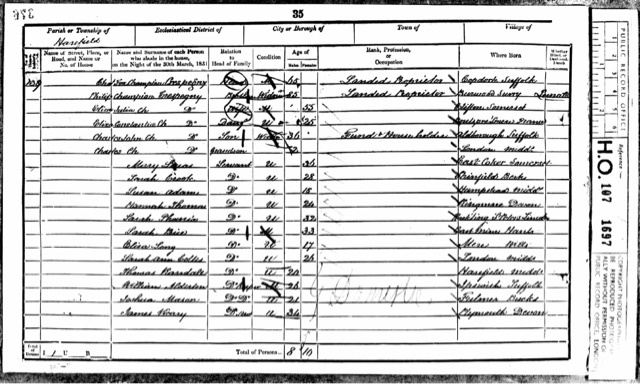 1851 England Census [database on-line]. Provo, UT, USA: Ancestry.com Operations Inc, 2005. Philip died on 22 May 1851, only a few months after the census was taken. He died without issue. 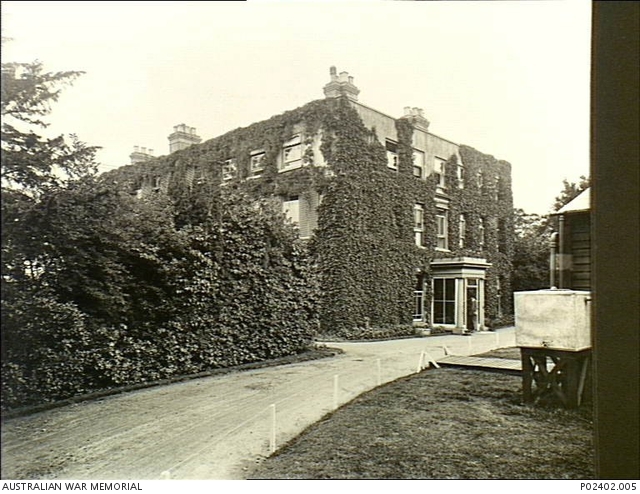 Harefield House was used as a military hospital by the Australian Army in World War I.
ID number P02402.005 Photographer John H Avery & Co Description Harefield, England. c. 1915-06. Exterior of `Harefield House’ the former stately home taken over by the No. 1 Australian Auxiliary Hospital (1AAH) in 1915-03. On the right is the corner of one of the first wards and hidden from view behind the shrubbery is the bay window of the first operating theatre (formerly the sitting room). (Original housed in AWM Archive Store) (Donor R. Brown). This is my first post following the Sepia Saturday theme. The prompt for this week was a photograph of musicians in 1947. While the musicians were in their shirt sleeves, I chose this photograph as it was taken the same year. There had also been a baby who died at birth in 1901. John’s father enlisted in the Australian Imperial Force in 1918 and was killed in Palestine in July 1918. (My earlier bog post from April 1913). John was only nine years old. The wedding pictured above is John’s second marriage. His first marriage of 1932 ended in divorce in 1939. At the time of his divorce he was an advertising specialist of Dawson Street, Ballarat. ( DIVORCE COURT. (1939, April 6). The Argus (Melbourne, Vic. 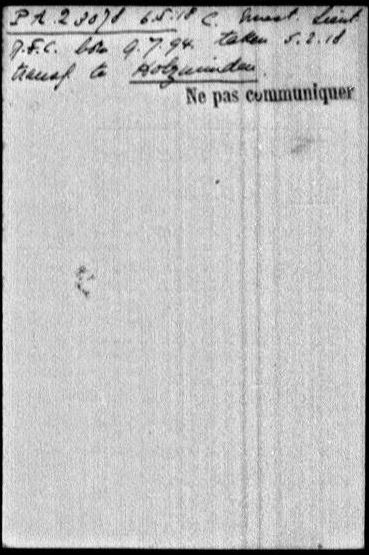 : 1848 – 1957), p. 2. 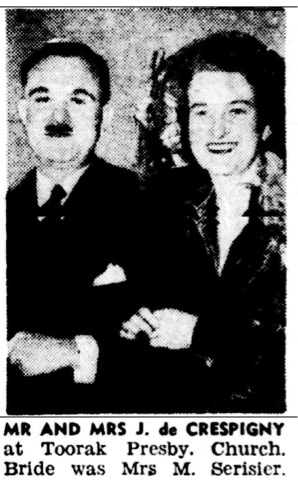 Retrieved August 29, 2013, from http://nla.gov.au/nla.news-article12115198 ) John’s second wife, Margaret Nicol (1909 – 1998), was the widow of Esmond Bernard Serisier (1905 – 1945). John died on 7 February 1995. His wife Margaret died three years later. John does not look nearly as relaxed as the musicians: weddings are not relaxing and it is not long after his experiences as a prisoner of war.